Brinks high range motion activated nighttime security lighting with selectable light timer (test, 1 min, 5, min and 10 min) and adjustable detection zone sensitivity. Activates automatically at dusk and deactivates at dawn. Manual override option allows light to be turned on and off using existing wall switch. Up to 70 foot detection range within a 240 degree zone. Includes unique EZ-N-Stall connector (makes wiring this fixture to your home a "snap") and protective lamp shields. Uses two (2) 120 watt maximum PAR outdoor flood lamps (not included). 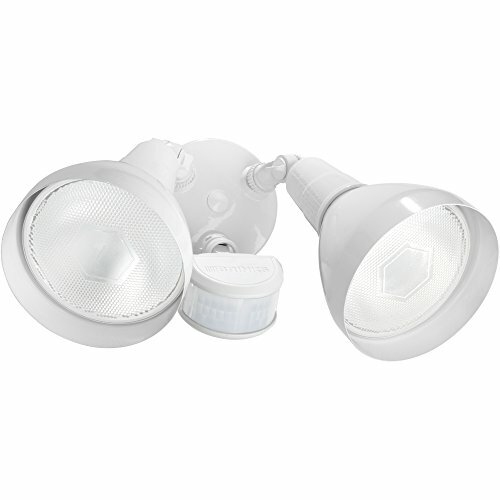 Arms and motion sensor are adjustable so you can focus your light where you want it. Perfect for illuminating dark, secluded areas or anywhere light is needed. Brinks is "A Trusted Name in Security Since 1859". If you have any questions about this product by BRINKS, contact us by completing and submitting the form below. If you are looking for a specif part number, please include it with your message.